There’s a digital disruption happening, and as an IT industry, we need to be aware of it and start to prepare. There are changes to come, but many are happening already, and it’s important that we take a leadership role during this period of rapid change. That begins by becoming innovation partners to business and moving away from being seen as back-office support. At SAP, we apply design thinking to help us navigate these rapidly changing tides, and it has taken us a while to begin seeing the returns on our investment in the process. We have found, over time, that design thinking is very effective in helping launch innovation projects. It has also helped us gain the trust of our customers and allowed us to demonstrate how we can be an innovation partner, going well beyond keeping systems up and running. Now we want to help our customers use the techniques we have been using internally, to help make similar changes within your organizations to improve business. Thanks to the consumerization of IT, a simple and intuitive user experience is no longer a nice-to-have. It’s table stakes. People expect to come into the office and be greeted by a user experience similar to the one they get on their smartphones, tablets and other personal devices. Instead, they’re often greeted by a user experience at work that is less intuitive and harder to use than the one on their mobile phones. Gartner, one of the leading analysts within IT, reported that user experience is the number one topic of interest for SAP IT leaders, moving up from number 16 in just a six month period. When it comes to placing user experience first, we’ve been making progress at SAP, going so far as to win one of the world’s most prestigious design awards, the Red Dot, for our next-generation SAP Fiori UX design concept. 1. We need to fill the design talent gap. If consumer software experience is the number one goal we need to achieve in the IT industry, then the ratio of designers to developers needs to improve. It needs to be more along the lines of one designer to every ten developers. Currently, within SAP and other enterprise software companies, that ratio is closer to 1 designer to 100 developers. 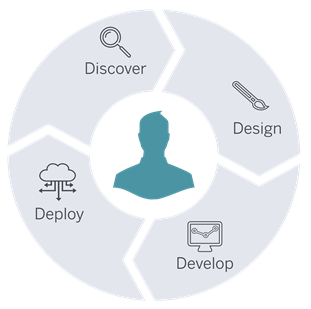 Drill down to our customers – those in IT organizations – and the ratio is closer to 1 designer to every 1,000 developers. This means there’s a talent gap in our industry – a big one – and we need to fill it. 2. We must recognize that not all designers are the same. There are, as I often say, two types of designers: design thinkers and design doers. If you are a design doer from the perspective of a software user experience, you likely specialize in a particular area, whether it be user research, interaction design, copyright design, information architecture or even design thinking. So, it isn’t enough to have one designer on staff charged with filling all of these roles or only filling one. These are different types of skills and expertise. This means we not only need more designers, we need a greater diversity as well. If you are an IT organization with a ratio closer to 1 designer to every 1,000 developers, you may be wondering how to bring the type of talent I described into your organization and ultimately create a center of excellence for design. The transition requires the creation of new artifacts, including interaction diagrams, journey maps and point of view statements. New processes, which I will address in a moment, also need to be introduced along with new mindsets. All of these must be addressed if an organization hopes to attract the designers they need. None of this happens overnight, but if you bring designers into your organization, apply the right process and allow space for design thinking before you begin implementing solutions, you can achieve great results. I want to take a moment to note an important distinction, however. Enterprise software is different from consumer software. Take Facebook as an example. Facebook can have a much higher designer to developer ratio because a select number of screens make up the Facebook user experience. Those relatively few screens reach over a billion users worldwide. Meanwhile, at SAP, we have hundreds of thousands of apps with hundreds of thousands of screens. This makes scale a particularly thorny challenge for enterprise software providers. It’s important to take a moment and look back on how we got here. The history of software development and IT methodologies holds some clues. It used to be that companies employed waterfall methodology for software development, which was very structured and took a very long time. Then, roughly ten years ago, Agile methodology arrived on the scene along with Scrum and Extreme programming (XP). This allowed for much faster iterations and pace. But it also surfaced the need for new technology to produce those fast iterations, collect feedback and allow developers to continue to make changes. Platform as a Service (PaaS), which came on the scene around the same time, was the solution developed to meet that need. It provided the tools the new methodologies required in a cloud-based setting and allowed multiple people to use them simultaneously. These tools focused less on traditional enterprise models of scalability and robustness and more on agility and speed. It has been wildly successful over the last decade. Today, however, speed and agility aren’t good enough; you also need to include design and user experience. That means PaaS is not enough. We also need User Experience as a Service (UXaaS). You cannot use technology to replace designers. Instead, UXaaS augments their skills, placing powerful tools at their fingertips. What is the process of combining PaaS and UXaaS? Here’s how I like to think of it. The process starts with a discover phase and then moves into design, which should look familiar to those with a background in design thinking. Then, there is develop and deploy phases, which is what we in the industry used to do without the previous two stages. The idea for UXaaS is to use technology to help facilitate the user experience – to complement the develop and deploy phases and the platform as a service tools that exist today. We are developing tools to help our customers implement aspects of this process. Here’s an example: Imagine if you were trying to build an app and you need people to give you feedback, but those people are spread around the world. You could fly people around and gather feedback, or you could create a tool that lets them interact with the app and provide feedback remotely. We’ve created that product. It’s called BUILD, and it can help guide you through the design phase of your process. This brings me to another important point: the need for education. At SAP, we are committed to educating our customers in the methods and processes we us. We do so in the form in-context learning around tools like BUILD and an offering of online courses, such as “Design for Non Designers” and “Developing Software Using Design Thinking“. We have built this content in order to give our customers the knowledge they need to better understand how to navigate the digital disruption. In addition to the technical tools and online learning content, we also seek to foster a community. This is a way for our clients to publish what they are doing and share what they learn. The real takeaway is this: Technology for technology’s sake is not the answer to the challenges facing our industry. We need to understand the “why” behind the current digital disruption. That requires a new approach to talent, an understanding of past and current methodology and a new approach to process. Then, technology will help us navigate the “how” in a much more structured way. my 365 days with SAP NW.